Jose Mourinho’s Chelsea team suffered a disappointment in the final pre-season friendly match against Werder Bremen after losing the match 3-0. The blues conceded two penalties in the 90 minutes, while they also allowed the opposition to score a soft goal. After the match, the Portuguese boss was extremely disappointed with the refereeing, as he felt that the two penalties were extremely soft as well. The first penalty was awarded for handball by John Terry, while Nathan Ake’s tackle in the second half lead to the second penalty. However, both these decisions could be 50-50 and Mourinho felt that it was unlikely that it went against his team. Mourinho is looking to win his first major title in two years. He finished his last season at Real Madrid without a major trophy and this was followed by another trophyless campaign at Chelsea last season. Speaking before the match, he said that he has come close to winning titles during this period. He also appeared to lose this famed control during the press conference when suggested repeatedly that he has not won titles in the last two seasons. Chelsea will be looking to put this defeat behind them, as the start of the Premier League comes closer. The blues will be taking on Burnley in the opening match of the season. “I learned nothing from this game. Our expectations are not fulfilled because when we decided to have this match here in Bremen we thought about an evolution in difficulty. We were expecting a fast game a competitive game but we come here and the referee thought this was a circus for Bremen fans – for them to have fun – and he killed the match. This game for us would have been perfect. The opponent is perfect for is to compete today but we couldn’t play,” said Mourinho. Premier League giants Chelsea has agreed a fee to bring Atletico Madrid left back Felipe Luis to Stamford Bridge. The 28 year old Brazilian international has been a long term target for the Premier League giants and with Ashley Cole confirming his move to AS Roma yesterday, the club pulled no punches in thrashing out a deal for the player with the Spanish champions. The 28 year old will now be given permission to discuss personal teams with the Blues, agreeing which, he will be have to go through a medical before officially becoming a player for the club. Chelsea’s Eden Hazard picked up an injury during their Champions League quarterfinal match against PSG. It still remains unknown when the Belgium player will be back in action for his club but according to the first-team coach Steve Holland, he could return sooner rather than later. Football pundit Glenn Hoddle feels that Chelsea manager Jose Mourinho got his tactics wrong in the Champions League quarter-final match against PSG. Chelsea suffered a 3-1 defeat in the first leg against the French outfit and it has put them on the brink of exit from the competition. Mourinho surprised everyone by naming Andre Schurrle ahead of Fernando Torres as the striker. The Portuguese manager was without Samuel Eto’o, who was ruled out with a hamstring injury, but many expected him to start either with Torres or Demba Ba. The plan did not make much sense because Schurrle was struggling to get into the match. He was drifting all over the place, which did not help Chelsea to keep the ball. After letting in a goal just three minutes into the first half, Chelsea managed to get back into the match through a penalty from Eden Hazard. However, bad defending from the likes of Cesar Azpilicueta and David Luiz made Chelsea concede two second-half goals, which has put their place in the semifinals in major doubt. Even though they have the second leg yet to come and with an away goal, pundits feel that Chelsea are almost out of the competition. Hoddle says that Mourinho should have started with Torres rather than Schurrle. “I don’t think Schurrle playing up front worked. Obviously Mourinho took him off, but I think that was one where he took a risk and it didn’t work. It backfired on him and they had no focus really in the second half. But you’ve got to give credit to Paris Saint-Germain. They probably weren’t happy with the way they were playing after they went 1-0 up and they had a good reaction,” said Hoddle. The second leg will be at Stamford Bridge next week, but PSG want to remain as underdogs. 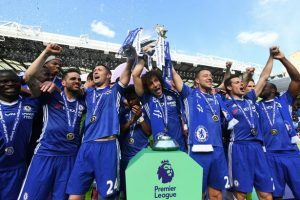 They currently sit atop the Premier League table, nine points clear of the ‘favourites’ for the title and most recently completed a 4-0 demolition of one of their prime London rivals in Tottenham Hotspur; Chelsea and Jose Mourinho can simply no longer deny they are the favourites for the Premier League title this year. With just nine games left of their season, Chelsea can begin to implement the one game at a time philosophy and use the star power in their ranks to widen the four point gulf that currently sets them apart from second-placed Liverpool. Chelsea defender Branislav Ivanovic has established himself as one of the important members of the squad in the last few years. His position has improved even more after the arrival of Jose Mourinho. Despite being a versatile player and capable of playing as a centre back, Ivanovic has been used in the right back position throughout this campaign. Apart from a month when he was out with injury, he has virtually played in every match for Chelsea. This great run of form has seen him be linked with a couple of clubs over the last few weeks. Paris St Germain are thought to be one of the suitors for his services, but the 29-year-old Serb has rejected any truth in the transfer rumours. He says that he is extremely happy at Chelsea and wants to stay with the London outfit for as long as he can. The impressive form of Ivanovic this campaign has made Caesar Azpilicueta play at left back, which has eventually seen Ashley Cole drop to the bench. Ahead of the international friendly for Serbia with the Republic of Ireland, Ivanovic stated his desire to remain a Chelsea player in the near future. Ivanovic has also revealed that the club can certainly win the league title ahead of Aleksandar Kolarov’s – his international teammate – Manchester City team. “I can say this is the happiest I have been at Chelsea because, at the moment, the team is doing well and things are going right for us. We have improved as a team since the beginning of the season, it looks like we are a very strong team but we have the potential to make and build an amazing team. We are here together to help our national team and that is what we are focused on. We don’t talk a lot about the league,” said Ivanovic. Chelsea star Eden Hazard is sticking to Jose Mourinho’s ‘underdog’ script, despite the Blues now being seven points clear of Liverpool at the top of the table and favourites with Paddy Power to win the Premier League. Young German international Marco Reus is regarded as a player with a lot of potential in the future. The Borussia Dortmund striker is just 24 years old and he is expected to get better once Robert Lewandowski leaves the club in the summer. John Terry has insisted Chelsea are looking forward to a gruelling final few months of the season, with the club battling for honours both domestically and in Europe. 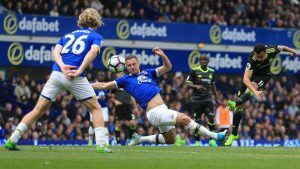 The 33-year-old scored an injury-time winner to send Chelsea to the top of the Premier League table with a 1-0 victory over Everton, shortening the club’s title odds with Betfair after climbing above Arsenal and Manchester City to take top spot. Chelsea managed to go top of the table after a convincing 3-0 win over Newcastle United, which made it 10 matches without defeat for the blues. This includes matches against the likes of Manchester city at the Etihad stadium, where they were expected to struggle.